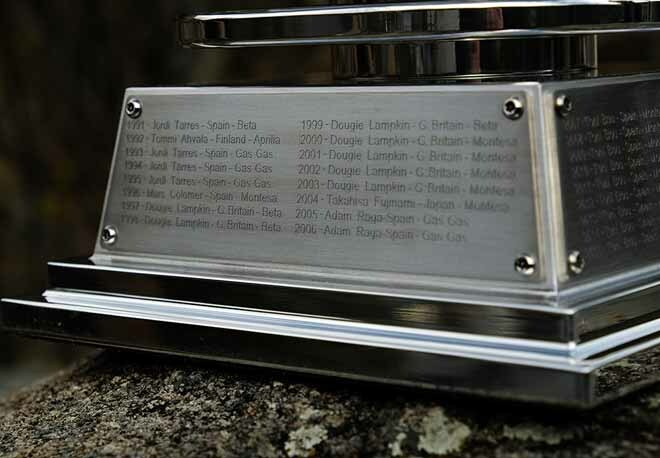 Forty-three years after the inaugural edition of the FIM Trial World Championship, Sport7 is proud to mark their first season as promoters of the TrialGP series by having commissioned a championship trophy that retrospectively celebrates the many FIM Trial World Champions over the last four decades plus. 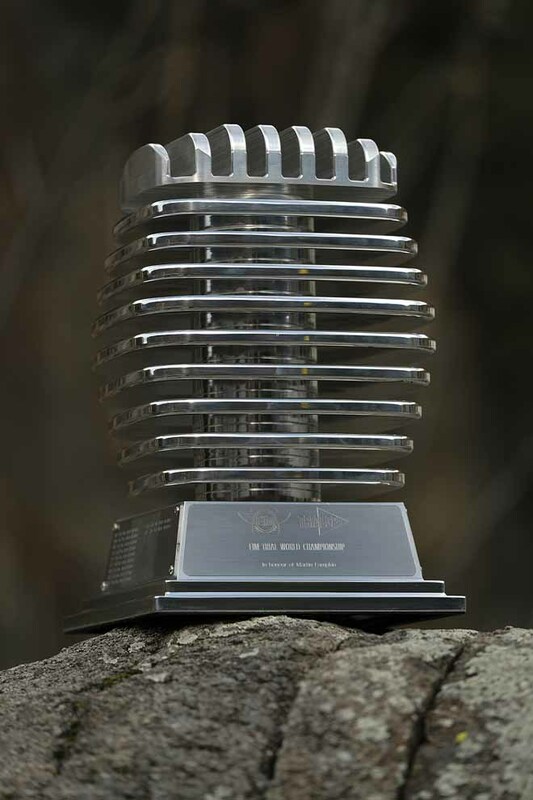 Created in honour of the late Martin Lampkin, the first ever winner of the series back in 1975, the trophy's contemporary design plays homage to the early era of the championship and the machines of that period. 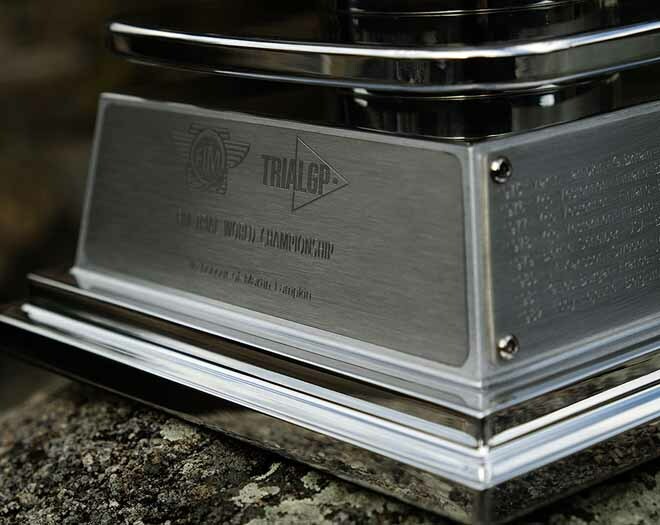 Fourteen different names of the FIM Trial World Champions from 1975 through to 2017 adorn the engraved plates that shroud the square base on which the main structure of the trophy rests. Measuring over three hundred millimetres high and weighing in at just under ten kilogrammes the metallic work of art has been beautifully crafted by TrialGP series partner Hope Technology. Designed, engineered and hand finished in their British factory the shining silver creation is a fitting salute to all those riders who have lifted the title over the years. 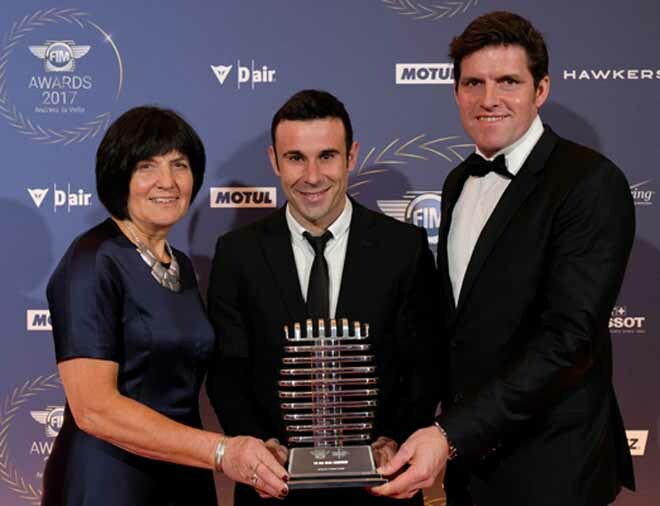 Using the occasion of the annual FIM Awards ceremony hosted in the principality of Andorra, Martin Lampkin's widow Isobel and his eldest son Dougie, a previous seven times FIM Trial World Champion himself, were on hand to present the new trophy to its first ever actual recipient Toni Bou whose name has now been engraved on the lower section for a record eleventh occasion. Delighted to be the first holder of the championship trophy Bou said. "It is a great honour to be the first FIM Trial World Champion to receive this very special and beautiful trophy here in Andorra. I would like to thank Sport7 for bringing this trophy to the championship and recognising all the many champions and also my own eleven titles too. Having Dougie and Isobel here to make the presentation made the moment even more special and I would like to thank the Lampkin family for their kind actions." Commenting on behalf of Sport7, TrialGP Championship Director Jake Miller added. "It seems incredible that this rich and historic FIM World Championship has never had an official trophy to recognise and celebrate the great champions of this Sport. As well as our work to promote and develop the series, we always felt it was our duty to create a lasting legacy for the championship, especially given our long and close association with Martin and the Lampkin family. To finally realise this magnificent trophy in Martin's honour and to have his family here to present it to Toni is something that we are very proud to have made happen." Nella foto Toni Bou riceve il trofeo dalla famiglia Lampkin, la vedova Isabelle ed il figlio maggiore Dougie.